MODERN ADDRESS Located on Old Field Rd. on Wilder Forest in the town of May. 1896: District established. School started that year in Mr. T.H. Hillary’s home for a month, until a wood building was erected Feb. of 1896. School lasted a month that year in that building. 1917: The building is destroyed by fire. Rumors spread that the fire was set off by a pro-German to protest World War I. 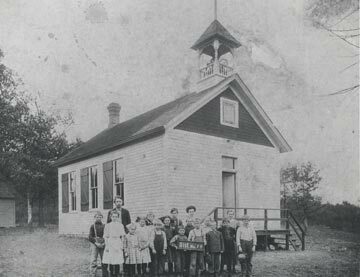 1918: The school is rebuilt, this time in brick. 1943: The school has one pupil left, and when the teacher failed to show up for school, and 2 more students arrived for school, the school closed. It was noted in the Gazette that for so young a district, the children’s attendance was excellent as well as their school work. Originally, the district was apart of district 4, but students in the western part found it hard to travel. The school was 30 ft. long, 12 ft. high and 20 ft. wide and painted white (the wood building). Enrollment in 1896: 23 students. In 1938: 12 students. There was known to be many conflicts between the townspeople and the school, more specifically the teacher. Consolidated into the Marine school district in the 1950s.